DIVISION IV SEMI-FINAL: Mayo 1-10 Roscommon 2-0 (Tuam Stadium, 19/2/1967). MAYO: M Gallagher; J Carey, R Prendergast, S O’Connor; J Earley, J Morley, M Flatley; PJ Loftus, J Langan; J Nealon, S O’Dowd (0-1), J Corcoran (0-7); J Farragher (1-0), MJ Ruddy (0-1), P Kilbane (0-1). Sub: J Gibbons for Loftus. DIVISION IV FINAL: Mayo 2-4 Galway 2-6 (MacHale Park, 5/3/1967). MAYO: M Gallagher; J Carey, R Prendergast, S O’Connor; J Earley, J Morley, M Flatley; PJ Loftus, J Langan (0-1); S O’Dowd (1-0), P Kilbane, J Corcoran (0-2, frees); J Farragher, MJ Ruddy, J Nealon (1-0). Subs: W Loftus (0-1) for PJ Loftus, J Gibbons for O’Dowd, V Jordan for Nealon. FIRST ROUND: Sligo 1-7 Mayo 3-6 (Markievicz Park, Sligo, 28/5/1967). MAYO: T Maughan; J Carey, J Fleming, S O’Connor; W Loftus, J Morley, M Flatley; PJ Loftus, J Langan (0-2); S O’Dowd (0-1), J Corcoran (0-1), M Connaughton (1-0); J Nealon (1-0), MJ Ruddy (0-1), J Farragher (1-0). Subs: J Gibbons for Connaughton, M Ruane (0-1) for Gibbons. SEMI-FINAL: Galway 1-8 Mayo 3-13 (Pearse Stadium, 25/6/1967). MAYO: M Gallagher; J Carey, R Prendergast, S O’Connor; J Earley, J Morley (0-1), M Flatley; PJ Loftus, J Langan; S O’Dowd (1-3), J Langan (0-1), J Corcoran (0-4); J Nealon (0-1), MJ Ruddy, J Farragher (1-2). Sub: M Ruane for MJ Ruddy. FINAL: Mayo 4-15 Leitrim 0-7 (Tuam Stadium, 16/7/1967). MAYO: M Gallagher; J Carey, R Prendergast, S O’Connor; J Earley, J Morley, M Flatley; PJ Loftus (0-1), W Loftus (1-2); S O’Dowd (1-0), J Langan (0-4), J Corcoran (0-6, frees); J Nealon, M Ruane (2-1), J Farragher (0-1). SEMI-FINAL: Meath 3-14 Mayo 1-14 (Croke Park, 20/8/1967). MAYO: M Gallagher; J Carey, R Prendergast, S O’Connor; J Earley, J Farragher (0-1), M Flatley; PJ Loftus, W Loftus; S O’Dowd (0-1), J Langan, J Corcoran (0-8, five frees); J Nealon (1-1), M Ruane (0-1), J Gibbons (0-1). Subs: J Morley for Earley, MJ Ruddy for Farragher, Farragher for Flatley. Mayo 0-4 Galway 1-9 (McHale Park, 15/10/1967). 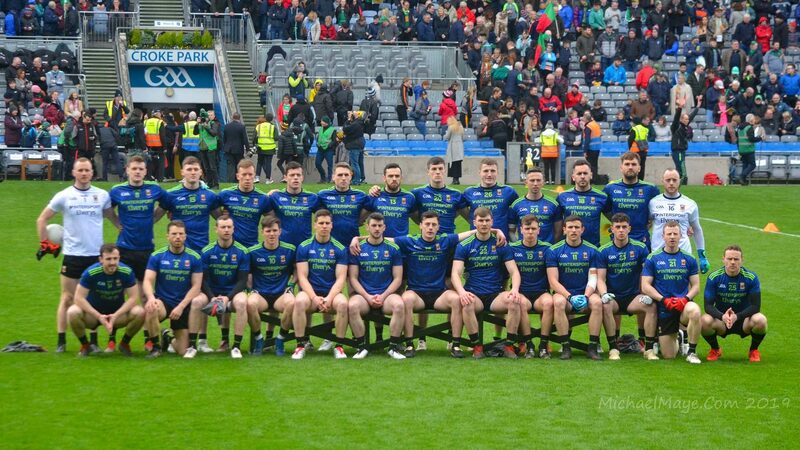 MAYO: M Gallagher; J Carey, J Fleming, S O’Connor; W Loftus, J Morley, J Ryan; PJ Loftus, J Gibbons; S O’Dowd, J Langan, J Corcoran (0-4); J Nealon, M Ruane, J Farragher. Subs: T Fitzgerald for O’Dowd, MJ Ruddy for Ruane. Clare 3-3 Mayo 3-8 (Kilrush, 29/10/1967). MAYO: M Gallagher; J Carey, J Fleming, S O’Connor;J Ryan, J Morley, W Loftus; PJ Loftus, J Langan; J Gibbons (2-2), Jimmy Langan, J Corcoran (0-4); W McGee, J Farragher (0-2), J Nealon (1-0). Mayo 1-8 Roscommon 1-6 (Charlestown, 19/11/1967). ). MAYO: M Gallagher; J Carey, J Fleming, S O’Connor; J Ryan, J Morley, J Earley; PJ Loftus, J Langan; J Corcoran (0-3), J Gibbons (1-0), T Fitzgerald; S O’Dowd (0-2), J Farragher (0-3), J Nealon. Australia 2-12 Mayo 2-5 (Croke Park, 5/11/1967). MAYO: M Gallagher; J Carey, J Fleming, S O’Connor; J Ryan, J Morley, W Loftus; PJ Loftus, Jimmy Langan; J Gibbons (1-0), Joe Langan, J Corcoran (0-3); J Nealon (1-0), J Farragher (0-1), T Fitzgerald. Sub: S O’Dowd (0-1) for Jimmy Langan. PRELIMINARY ROUND: Galway 0-5 Mayo 1-13 (Tuam Stadium, 23/7/1967). MAYO: E Rooney; J Ryan (0-1), C Loftus, PJ Golden; J Earley, T Cafferkey, M Flatley; W Loftus (0-1), T Keane; S O’Dowd (0-2), J Gibbons (1-0), T Fitzgerald; W McGee (0-2), JJ Cribben (0-2), M Lally (0-5). SEMI-FINAL: Mayo 4-14 Leitrim 2-3 (Fr O’Hara Park, Charlestown, 30/7/1967). MAYO: E Rooney; J Ryan, C Loftus, PJ Golden; J Earley, T Cafferkey, M Flatley; W Loftus, T Keane; S O’Dowd (1-4), J Gibbons (1-0), T Fitzgerald (0-1); W McGee (0-2), JJ Cribben (0-3), M Lally (2-4). Sub: T Joyce for Keane. FINAL: Mayo 3-11 Roscommon 2-8 (MacHale Park, 6/8/1967). MAYO: E Rooney; J Ryan, C Loftus, PJ Golden; J Earley, T Cafferkey, M Flatley; W Loftus, T Keane; S O’Dowd (0-2), J Gibbons (3-3), T Fitzgerald (0-1); W McGee (0-1), JJ Cribben (0-2), M Lally (0-2). Sub: J Clarke for Keane. SEMI-FINAL: Mayo 3-9 Derry 1-8 (Fr O’Hara Park, Charlestown, 27/8/1967). MAYO: E Rooney; J Ryan, C Loftus, PJ Golden; J Earley, T Cafferkey, M Flatley; T Keane, W Loftus; S O’Dowd (0-2), J Gibbons (1-0), T Fitzgerald; W McGee (1-0), JJ Cribben (1-4), M Lally (0-2). Subs: J Clarke for C Loftus, P Nevin (0-1) for W Loftus. FINAL: Kerry 2-10 Mayo 2-10 (Croke Park, 10/9/1967). MAYO: E Rooney; J Ryan, C Loftus, PJ Golden; J Earley, T Cafferkey, M Flatley; W Loftus (1-0), T Keane (0-1); S O’Dowd (0-2), J Gibbons (0-1), T Fitzgerald (1-0); W McGee (0-2), JJ Cribben (0-2), M Lally (0-2). FINAL (REPLAY): Mayo 4-9 Kerry 1-7 (Duggan Park, Ballinasloe, 8/10/1967). MAYO: Eugene Rooney; Joe Earley, Christy Loftus, Noel McDonald; Jimmy Ryan, Tom Cafferkey, Martin Flatley; Willie Loftus (0-1), Tom Keane; Seamus O’Dowd (0-4), John Gibbons (0-2), Tom Fitzgerald (0-1); Willie McGee (4-0), Jimmy Smyth (0-1), Des Griffith. Sub: John Clarke for McDonnell. PRELIMINARY ROUND: Mayo 5-3 Sligo 0-5 (Fr O’Hara Park, Charlestown, 2/7/1967). MAYO: P O’Brien; A Gibbons, K Mahon, F McGrath; G Nevin, S Hughes, P Warde; P Kelly, S O’Grady (0-1); D Griffith (0-1), A Kelly, B O’Reilly (1-1); T Cribben, J Smyth (1-0), P Glavey (3-0). Sub: H McGarry for McGrath. SEMI-FINAL: Galway 1-4 Mayo 2-10 (Tuam Stadium, 16/7/1967). MAYO: P O’Brien; A Gibbons, K Mahon, P Warde; G Nevin, S Hughes, H McGarry; S O’Grady (0-2), P Kelly; D Griffith (2-2), A Kelly (0-1), B O’Reilly (0-3); T Cribben (0-1), J Smyth, P Glavey (0-1). FINAL: Roscommon 2-5 Mayo 1-5 (St Coman’s Park, Roscommon, 30/7/1967). MAYO: P O’Brien; A Gibbons, K Mahon, P Warde; G Nevin, S Hughes, H McGarry; S O’Grady, P Walsh; D Griffith (1-0), A Kelly, B O’Reilly (0-4, three frees); T Cribben, J Smyth (0-1), P Glavey. Subs: J Roughneen for Walsh, S Kilbride for Cribben, S Cleary for Roughneen.